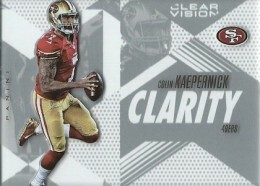 2015 Panini Clear Vision Football is the company's spin on an all-acetate release. Base cards, inserts, autographs and memorabilia cards are all done on the clear plastic stock. It's also the company's first product of 2015 to include rookies in their NFL uniforms. Boxes are on the small side with just 18 cards but they have six packs. The base set should stand out as it's done with the clear style. 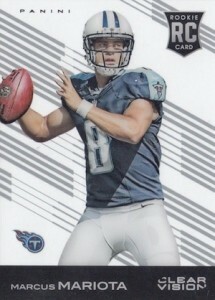 Rookies are inserted two per box. Approximately every other box has a photo variation. Veteran variations are about 1:9 boxes while rookie variations land four per nine-box inner case. Base set parallels are all numbered to 99 or less: Blue (#/99), Red (#/25), Gold (#/10), Green (#/5) and Purple (1/1). Parallels are inserted one per box. 2015 Panini Clear Vision Football has autographs but they're not very common. They're just one per nine-box inner case. However, all are numbered to 50 or less and all are signed on the acetate. That means zero stickers. Clear Vision Signatures and Visionary Signatures are among the autograph inserts. Key singers include Tom Brady, Peyton Manning, Andrew Luck, Barry Sanders and John Elway. With autographs being the exception, that leaves memorabilia cards for the majority of boxes. All of these are numbered to 99 or less. Clear Cloth Jersey come with a layered look. Player images are put on top of the material. 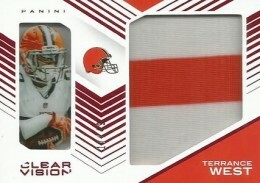 Clear Vision Jumbo Jersey cards come with an over-sized swatch using a horizontal design. Although not a traditional hit, each box of 2015 Panini Clear Vision Football has one thick Clarity or Stained Glass premium insert. Boxes also have one additional insert that's done in a similar style to the E-X sets from the late 1990s and early 2000s. These come with multiple layers. 165 cards. Shop for base sets on eBay. 15 cards. View a detailed gallery for all the variations. 20 cards. View a detailed gallery for all the variations. 37 cards. There are gaps in the checklist. This may not be a popular sentiment, but I love this setup for a product. No watered down, crappy sticker autos, and it’s not flooded with “hits.” They actually took the time to put together a new and different base set that looks pretty compelling. From what I’ve seen, the price point is about $60, which is perfectly reasonable. I will definitely grab a box of these when they arrive! 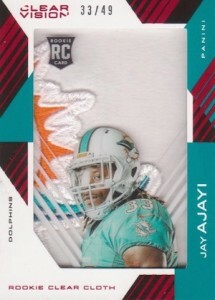 Looks to be same thing as Prizm. Hard to see which will be better. I guess this is the common theory at Panini and Topps, just produce a bunch of stuff, put stickers on it, and hope by puting a huge price tag on it collectors would be tricked into thinking just because it’s expensive that you’re getting something that’s worth that much. I’ve downsized my collecting because it’s not worth it anymore. So much junk out there and they want that $$$ for it. The only thing I seem to be buying is Leaf products because they’re the only ones that seem to see what is happening in the hobby with overproduction and waste base. Love that they only produce a very limited case amount that they state opening instead of the Bowman Baseball 1,000,000 cases. Mike Pereira � Panini has said this set will have no stickers. Mike….all on card autos with a limited checklist (only two duds that I can see) and $60 a box. Did you read the product description before hating on it? The Autograph checklist looks incredible. Consolidated and Rich. 1 in 9 odds for an auto, pass on this product. Pre-release I saw on a hobby board, most of that break came up chipped big time. These aren’t pre-signed stickers, but pre signed acetate slabs that are then glued to the actual card. Just did an 18 box case break. Fun product. I had 4 teams, no autos but a couple of relics, 1 prime. Got some parallels and a thick glass clarity card. Overall, for the price point, it’s probably ok. I like the looks of the cards. They are not the usual acetate type. There is some depth to some of them and the pictures actually kind of pop. 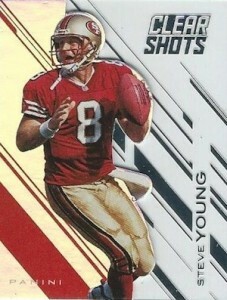 Vets are shown in original rookie team uniforms on some cards. The 2 autos of the 18 box case were Russell Wilson and Odell Beckham Jr. So, it looks like when you get an auto, it’s pretty big. I got one RC parallel #/10. Overall, I like it very much. Opened one box because its fun to open new product that we receive in our store and I have to say I am not impressed. Out of the 7 pack hobby box I got a blue Joe Flacco Base numbered to 99, a team vision insert of the Patriots, a clarity insert of Jay Cutler, 2 of the Rookie Revisions, and a Duke Johnson jersey card numbered to 99. For base I got TWO rookies. OUT OF THE HOLE BOX. I figure the resale value is less than $30 if you don’t hit a decent auto or jersey card. I just got back into collecting after a long break and picked up a box of these and a few other brands. Of the boxes I got, this was the cheapest. I ended up grabbing two boxes to see how things came out. The box breakdown is basically this: 3 packs will be thick, 3 packs will be thin. Of the thick packs, one will just have a cardboard piece while the other 2 have inserts of value. Of the thin packs, 1 will be a crap, and the others will have cards of value. So basically 1/3 of the box is almost guaranteed filler junk no one wants. In my opinion, beyond the rookies, the base set is as complete crap. Of the non-insert or rookie cards, I received 3 pair of duplicates, and that’s out of only 24 cards. I don’t see anyone caring about any of them unless some of the huge names aren’t as mass produced. Since every box has either a Clarity or Stained Glass card, and those sets are small, they won’t be worth anything either. So what’s left? To me, other than the rookies in the base set, the entire box revolves around the (1) auto or memorabilia card, the (1) parallel, and the (1) random insert. Long story short, you’re spending ~65 for 5 cards, which isn’t totally insane I guess. If you look at the checklist, you’ll see that those 5 cards can be really bad, though. Rookies – Yeldon, Artis-Payne, Duke Johnson, Tevin Coleman. I’m just glad a Yeldon showed up. Parallel – /99 Mariota, /99 Patrick Peterson. 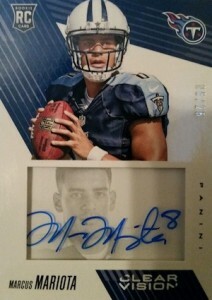 The Mariota was a nice hit for me. Autograph or Memorabilia – /99 clear cloth Sammy Watkins, /99 rookie clear cloth Maxx Williams. Nothing to get excited about, but the Maxx cloth actually looks pretty sick with how the cloth landed. Additional Inserts – Clear Shot Dez Bryant, /25 Double Vision Victor Cruz/odell Beckham jr. Double Vision was a great hit, and the Dez Bryant is a really nice looking card, and might fetch $5. For me, the Yeldon rookie, the Mariota parallel, and Double Vision card kind of saved the boxes for me. Remove any of those cards, and it would have been a big loss for me. My final verdict, I actually really enjoy the cards and am happy with the product, but there’s going to be a lot of very unhappy people with how the 5 cards might pop out. I might dip into 1-2 more boxes, but it’s a big gamble at $65, you can very easily end up with $10 worth of cards in most boxes. for 60 bucks cant really complain. Definitely a chase products with autos being so rare. would not buy a whole case as 1 auto per case is unacceptable to me, but for 60 bucks i think itd worth a single box break or 2. I’m giving this product 4 stars for a few reasons. #1 – I bought my first box at the National to do a box war at the Panini booth. The goal of the box war was to get closest to base card #101 (Jameis Winston). Myself and another person both had card #100 until my next to last pack and I pulled #101. By winning, I scored a Panini Black Box that had a Sammy Watkins #/10 auto/patch. Overall, a great buy. 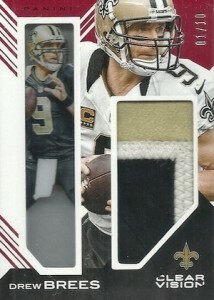 #2 – I went back to the dealer I bought the Clear Vision from and bought another box and test my luck. I ended up with a double vision of Brady/Garrapolo, clear shots of Megatron, rookies of Kevin White, Devin Funchess (variation), Jeremy Langford and Vic Beasley, a couple clarity cards of Marshall Faulk and Colin Kaepernick, a rookie clear cloth of Dorial Green-Beckham #/99, a clear cloth of Lorenzo Taliaffero #/25. Overall, I was pretty happy with what I got. For $60, I think it’s actually a cool product and pretty cool to look at. It’s something that an average collector could get into, but has decent hits that others could chase. I’m just getting back into the hobby after a long hiatus, and I find this product to be a nice bridge between low-end and high-end of collecting. I will be buying more of it. Tried 1 box not expecting much. 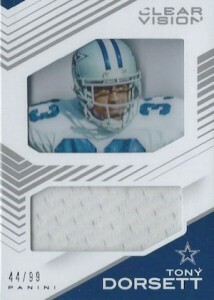 Tony dorsett clear auto in pck 1. Like the design, but have a question about the Orange Parallel inserts. Quite a few people advertising them as SSP (less than /10). I didn’t see any mention of them above. Does anyone know the print run? Jeff � The Orange versions are listed among the parallels above. I have still not come across anything that specifically lists the print run. 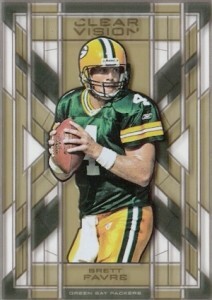 Jeff & Trey – Beckett.com has both the Gold and Orange parallels numbered to 10. That said, given the simple fact I pulled 3 orange parallels out of one 9 box case, I find it hard to believe they truly have a print run of 10. So I grabbed a lot of parallels & one was an orange with #/10 on it. Someone on eBay has one that’s orange & it doesn’t have that. Could it be a possible error or more production then led to believe?? 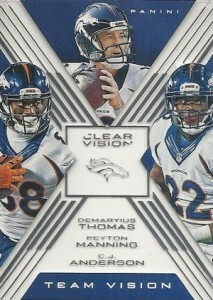 I think 2015 Panini Clear Vision is a solid value product. The auto checklist is very favorable and the price is right. 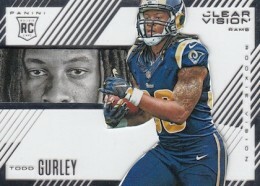 Group break on a case last night and personally hit a Gurley auto /50. I took off a star due to only 1 auto, but for the price, I think it’s a good product.